August 24, 2012  Anders Behring Breivik got the maximum sentence. But if he's still considered to be a danger to society, his stay in prison could extend far beyond the 21-year term. April 26, 2012  Anders Behring Breivik killed 77 people. He thinks a folk song that speaks of there being "one world" is brainwashing Norwegians. 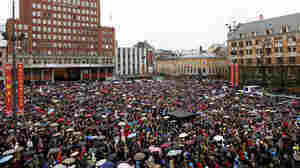 Today, thousands gathered to sing that song to show him they believe otherwise. See the video. 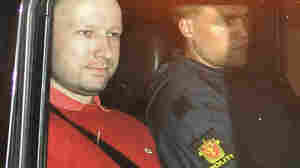 April 17, 2012  Anders Behring Breivik, an anti-Muslim extremist, again insisted he is the leader of an "anti-communist" resistance movement and an anti-Islam militant group he called the Knights Templar. He killed 77 people, many of them teenagers. 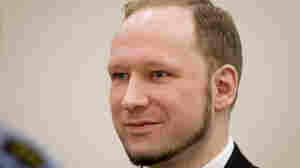 April 10, 2012  Anders Behring Breivik, the Norwegian man who confessed to killing 77 people last July, was not criminally insane when he bombed a government building and gunned unarmed people down at a youth conference, according to two psychiatrists appointed by a court in Norway. August 2, 2011  Confessed Norwegian murderer Anders Behring Breivik's "manifesto" references many papers dealing with science and global population. But what if you were a writer — and you learned that the man who killed 77 people had quoted some of your work?